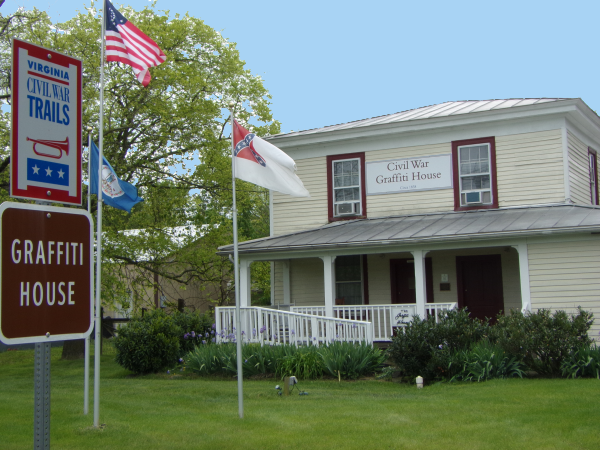 The Graffiti House (below) served as a field hospital for the South during this and other local battles during the war. It also served as a headquarters facility for the Federal forces during the winter encampment of 1863-64. Soldiers from both sides made drawings and signed their names and units on the walls. Rediscovered in 1993, much has been preserved. The Graffiti House is open to visitors from 11:00 to 4:00 on Saturdays and Sundays. It is closed beginning Sunday, December 23, 2018 and will reopen on March 2, 2019. Through AmazonSmile persons who buy items from Amazon can designate their favorite charitable organization, Brandy Station Foundation. AmazonSmile is a website operated by Amazon that lets customers enjoy the same wide selection of products, low prices, and convenient shopping features as on Amazon.com. The difference is that when customers shop on AmazonSmile (smile.amazon.com), the AmazonSmile Foundation will donate 0.5% of the price of eligible purchases to the charitable organizations selected by customers. All one has to do is type Brandy Station Foundation in the box when prompted to pick your own charitable organization.